LONDON, England (CNN) -- It may be one small step for civilian space travel, but it's a leap for education. The Space Frontier Foundation hopes to send 200 astronaut teachers into space every year. In a bid to inspire the younger generation, the private Space Frontier Foundation is looking for two teachers -- Pathfinders -- who will become the first educators to fly to space and then return to the classroom. The foundation, in partnership with the United States Rocket Academy, has revived the Teachers in Space program originally run by U.S. space agency NASA. The idea of sending teachers to space was conceived in the 1980s by U.S. President Reagan. The goal was to pick the first "citizen passenger" and promote the space program. In 1985, NASA picked New Hampshire teacher Christa McAuliffe from 11,000 applicants to be the first teacher to fly into space. But the Challenger tragedy, in which the shuttle exploded 73 seconds after liftoff, killing McAuliffe and six other crew members, brought the program to a premature halt. In its place, the space agency instituted the Educator Astronaut program, in which former teachers became full-time NASA employees. They did not return to the classroom to share their experiences. More on "The Spirit of Space"
The new project has a different goal: "Unlike the Educator Astronaut program, which takes teachers out of schools to join the NASA astronaut corps, we want to put astronaut teachers into American classrooms," explained the program project manager, Edward Wright. Since space exploration began 50 years ago, children have been encouraged to study math and the sciences so they can go into orbit. Do you think an astronaut teacher would have inspired you to study science or math? "But at the rate NASA recruits astronauts, these kids would have a greater chance becoming NBA players than going to space. We want to turn that around. We want them to go to space," said Wright, who is also chairman of the United States Rocket Academy. With the project, Wright said from Seattle, Washington, the Space Frontier Foundation wants to show students that they have a real chance of going to space. And the best way to do that is to send astronaut teachers into American schools to share their space flight experience. The group also hopes the project will spur interest in math, the sciences and space exploration while providing "cheap access to space." The project, which has a budget of $20 million, will enable the Space Frontier Foundation to send 200 teachers a year -- four from every U.S. state -- into space. "We want to put a thousand astronaut teachers into American schools within the next decade," Wright added. The program has generated interest abroad, too. "I co-authored a paper in Japan, and there has been interest from people at the British Interplanetary Society as well as Ireland. But right now, the focus is the U.S., because I'm from here," Wright said. In their search for the two Pathfinder Astronauts, the project organizers are running two programs. The ideal candidates are math and science teachers; those applying for the second program will have to submit a paper on human space flight. Since the project is dependent on sending teachers back to school once they return from space, it won't be taking them way from their day jobs during training, which will be on weekends and during the summer. "There will be about three weeks of training in total," Wright said, "which will include both space flight training and professional development activities to improve their abilities as teachers. We also hope the Pathfinders will come back and help us train future astronaut teachers." Adding impetus to the project is the development of the private space-flight industry. The project hopes to use safe, reusable spacecraft that can travel into space and return to Earth without any need to dispose of hardware. Like airplanes, they may require little more than refueling before their next flight. Private companies are now developing these kinds of spacecraft. The first such vehicle, the SpaceShip One, was tested in 2004 and won the $10 million Ansari X-Prize. The project has secured flight pledges from five private companies, including XCOR Aerospace, which is under contract to provide them with the suborbital spacecraft, Lynx. For now, the foundation continues to hunt for teachers. Potential Pathfinders can apply until December 4. 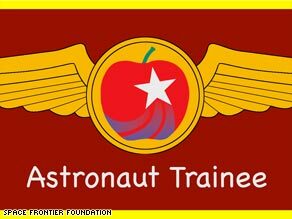 Training will begin in 2009 to get the teachers ready for takeoff in 2010 or 2011.